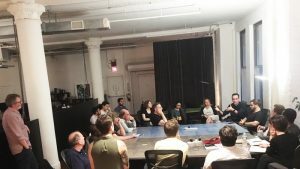 Open Source NYC meets up | Boyle Software, Inc.
We have been thrilled to play host to the Open Source NYC Meetup a couple of times in recent months at our HQ at 42 West 24th. Last week’s Meetup featured a compelling discussion of intellectual property law as it relates to open source development. Topics ranged from the problem of proprietary platforms constructed upon open source foundations to more nuts-and-bolts issues like licensing. Back in July the discussion was all about GitHub in the wake of its acquisition by Microsoft, with people from GitHub as well as GitLab there to answer questions and share their insights. Do you have a tech-centric Meetup that could use a space to gather every so often? Drop us a line and let’s discuss it!